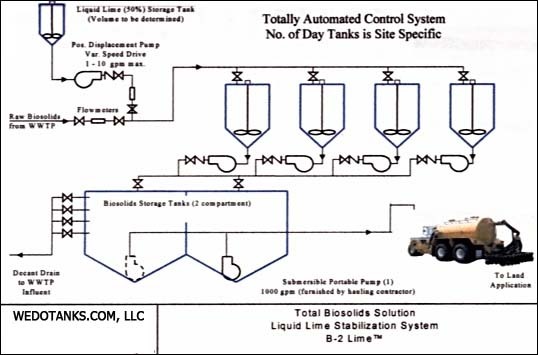 This unique and automated system feeds the correct amount of liquid lime (CACO calcium oxide) to any type of liquid biosolids for achieving EPA 503 Class “B” stabilization results. This system can be adapted almost any type of WWTP for the stabilization of biosolids. This system provides a very simple method to achieve Class “B” stabilization and at the same time will enhance the settleability of the biosolids once it is put into storage. In one particular user’s case, the cost of the liquid lime to treat the biosolids was approximately $0.0025/gallon. Previously they had been hauling solids of less than 1.5%, now they are averaging over 8.0% to land application. The cost savings due to volume reduction will recoup the cost of the system in a relatively short period of time. A sampling of the references utilizing the wedotanks®‘ tank system and liquid lime stabilization can be found in Lime Stabilization in the reference section of this website. The following is a schematic of the system, each system is specifically designed to each individual WWTP. In many cases, existing plant pumps and tanks can be utilized to help acquisition and installation costs to a minimum. If you are interested in receiving more information on this system, please fill out the questionnaire and submit it to our office. Click here for Liquid Lime Information Guide.